I will warn you in advance. You will have to cut these bars into little bitty squares. This may be difficult as they are about 2 inches thick. Do not blame me if you use your calorie allotment for the day eating these; blame Mr. D. He sandwiched two of our favorite cookies, brownies and chococolate no bake cookies, around a filling of marshmallows and butterscotch chips. It is the ultimate chocolate cookie bar. Although my child really couldn’t say a whole sentence before he was three….I’m thinking I may have a genius on my hands. Now, Mr. D didn’t use my favorite brownie recipe, he used the recipe from the back of the hershey’s cocoa can (which I will repeat below). A perfectly acceptable shortcut would be to make the brownies from a box. He did, however, use my chocolate no bake cookie recipe. Feel free to leave out the butterscotch chips, but the marshmallows must remain. I will pray that you have the strength not to eat the whole pan. Make the brownie layer; stir together the sugar, butter and vanilla. Add the eggs, one at a time, mixing well after each addition. Add the cocoa and beat until blended. Add flour, baking powder and salt; beat well. Pour into a greased 15x10x2 baking pan, bake at 350 degrees for 30 to 35 minutes. As soon as they come out of the oven spread the marshallows over the top to completely cover and then sprinkle on the butterscotch chips. 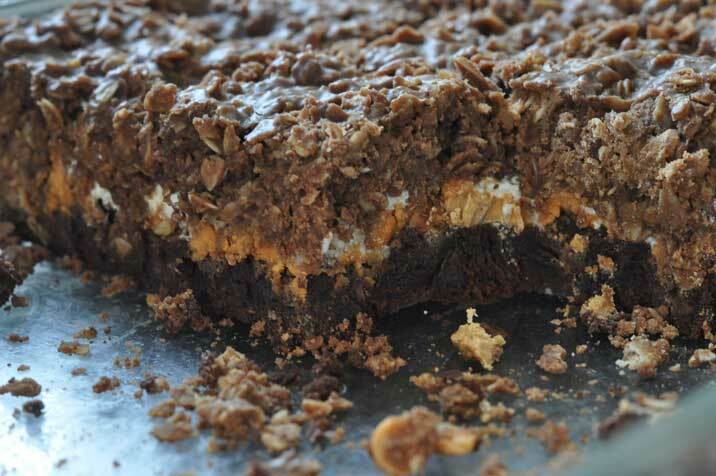 Immediately spread the chocolate no bake cookie batter over the marshmallow/ butterscotch chip layer. Cookies are done when the no bake layer has hardened. Good luck only eating one.